Philip Gooden is a thoughtful and interesting writer, of high quality crime fiction and much else besides, who was Chair of the CWA a few years back. He and I talked about Michael Innes recently, and I asked if he'd like to write a few lines for the blog on the subject of a personal encounter he had with Innes, in his role as academic rather than novelist. As for me, I think I've been unlucky with Innes - I tried one or two of his later novels as a teenager, and they didn't grab me. But he was a major figure of his era, and Philip's enthusiasm for him - he's very knowledgeable about literature - makes mey feel I should give him another try. And I've certainlly always liked Innes' short stories, anyway, which are slight yet very entertaining. "Michael Innes wrote dozens of golden age whodunnits, most of them featuring John Appleby, the detective who rises to become Commissioner at Scotland Yard. Under his real name, J.I.M.Stewart, he produced a substantial quantity of straight novels as well as academic studies. (Innes was his middle name.) Stewart was a long-time Fellow of Christ Church, Oxford, and his crime fiction regularly had the ‘donnish’ label attached to it. When I was at university in the late ’60s, I went to see Stewart lecture because I’d enjoyed a couple of the Appleby books and was curious to see him in academic action. Appleby and donnishness perhaps represented the antithesis of almost everything that was happening in universities in 1968/9, and Stewart looked a bit of a throwback compared to trendier lecturers like Christopher Ricks or John Carey. With his well-cut suit and silvery, slicked-back hair, he reminded me of an uncle of mine who was an accountant. Stewart had written all or most of the ‘modern’ volume of the Oxford History of Literature, which first appeared in 1963. This was a time when the cut-off date for literary studies at Oxford was 1945, so the modernists he discussed were authors like Thomas Hardy, Henry James and James Joyce. I think that he was talking about Joseph Conrad that morning. The lecture wasn’t very well attended and, disappointingly, he didn’t really address the few people in the room but merely stood at the lectern and read - head down - from the relevant chapter in his book. The only moment I remember is that he had evidently changed his mind about something he’d written for he suddenly glanced up and said: “That’s nonsense, by the way.” He didn’t expand on why it was nonsense but went back to reading from his script. J.I.M. Stewart’s straight novels are pretty well neglected these days, which is a pity as in their circuitous way they have quite a bit of charm and narrative dexterity. In particular his quintet, A Staircase in Surrey, is difficult to put down (round about the time you’ve reached volume 3). So it’s good to see some of the Appleby books are reprinted by House of Stratus and also available on Kindle." The British Library is a wonderful institution, but it's only in recent times that I've found any time at all even to begin to explore its treasures. I really enjoyed its exhibition earlier this year about the history of crime fiction, and since then I've been keeping an eye on their publication list. One venture that fascinates me is their decision to publish some classic crime titles. The Notting Hill Mystery, first published as an eight part serial in 1862-3 is generally regarded as the first full-length detective novel (Poe, of course, had written detective short stories a couple of decades earlier) and the British Library's nicely produced edition boasts an intro by Mike Ashley. I've never actually met Mike, but I've contributed numerous short stories to anthologies he's edited. He's not only a very good editor but also extremely knowledgeable about the history of crime fiction. The Female Detective by Andrew Forrester introduces the first female detective, and the Library's edition includes not only another intro by Mike Ashley but also a short preface by Alexander McCall Smith. Mike again introduces Revelations of a Lady Detective, by Williams Stephen Hayward. More interesting titles are in the pipeline. I'm especially intrigued by The Santa Klaus Murder, a Golden Age mystery by Mavis Doriel Hay, which first appeared in 1936. I must admit I'd never heard of either book or author, and look forward to its arrival on the shelves in November. I very much hope that the British Library will continue to make available rare novels of this kind, and I do like to think that this is yet another illustration of an upsurge of interest in the once-maligned detective puzzles of the Golden Age. Perhaps their time has come again!. My Forgotten Book today is Nicholas Blake's The Beast Must Die, which dates from 1938. Most people think it is the best crime novel Blake, better known as the poet Cecil Day Lewis ever wrote, and though I haven't read a lot of his work, I must say that I'd be amazed if he had surpassed this one. It's a fine combination of character study and puzzle. Blake is interested in exploring the consequences of revenge and a guilty conscience, but these large themes do not get in the way of a clever and satisfying puzzle. The structure is daring and unusual, but also well integrated into the plot. The first part of the book is narrated by crime writer Felix Lane, who announces that he is going to kill a man, though he doesn't know who he is or where he lives. His target is the driver of the car that killed his son in an accident. It's a dazzling start and this first section of the story is genuinely memorable. Lane finds his man, but the viewpoint then shifts, and he seems to be outwitted by his quarry - who is then murdered. But who killed him? He was a nasty piece of work, so motives abound. Nigel Strangeways, private inquiry agent, tries to help Lane as the police focus on the writer as their prime suspect. The switch in the style of story is a bit startling, but pretty well handled, I felt. The finale is slightly reminscent of that n Henry Wade's Mist on the Saltings, a book I much admire. But there is a good deal about Blake's novel that is original and impressive. It's definitely one of the most notable Golden Age mysteries, even though I've never totally warmed to Nigel. Blake really could write, and here he is on top form. One of the joys of digital publishing is that it has made it possible for those of us who are fans of Golden Age detective fiction to acquire, at long last, copies of books that have long proved elusive. I've mentioned Bello and Faber Finds here in the past, and there are various other outfits who are doing sterling work in reviving old titles so that a new generation of readers can enjoy them. But, at least for the present, there remain a great many obscure books that are still very hard to find. (Okay, some of them deserve their obscurity, but by no means all of them!) And there is something about having an original hard copy edition that is still very appealing to book lovers. But even if one can find a rare title, the question is whether one can afford it. And often, the answer is no. There was a startling case on eBay recently when a little-known book by the prolific John Rhode, under his other pen-name, Miles Burton, was sold for in excess of £500. Yet this was a former library book that, from its description (by a totally honest bookseller from whom I've bought many much cheaper titles) was in pretty scruffy shape. The book was To Catch a Thief - no connection with the Cary Grant movie, though. Normally, you expect that a really expensive book will be accompanied by a dust jacket in good condition, or perhaps a really significant signature or inscription. This did make me wonder if prices for rare Golden Age books are shooting up well ahead of inflation, driven by scarcity plus increasing interest and demand. When I talk to dealers like Jamie Sturgeon and Mark Sutcliffe, partly out of interest and partly as research for my portrayal of the world of Marc Amos in the in the Lake District Mysteries,the general theme is that it is harder to find old books in good condition than ever before. There is one rule that I've learned. If I come across an old book acceptably priced that I'm interested in, I tend to go for it. But the other day, at a book fair, I broke my own rule, and when I returned to the stall a few minutes later, the book I wanted had gone. A lesson learned! I'm delighted to announce the publication this week of Deadly Pleasures, an anthology I've edited to celebrate the Diamond Jubilee of the Crime Writers' Association. The book is published by Severn House in hardback and trade paperback and will be available in the US as well as the UK. Putting this book together has been a labour of love, since I've been lucky enough to receive a host of marvellous - and brand new - stories by some wonderful writers. Let me just pick a few at random to give you the idea. John Harvey has written a new Jack Kiley story, which deals with a tricky and highly topical social issue. Peter Robinson has supplied a fascinating story, based on a performance piece that he worked on last year along with the great folk singer Martin Carty. Liza Cody tells us a bit more about the fate of Anna Lee - or does she? Andrew Taylor, who just won (most deservedly) the Ellis Peters Historical Dagger, has contributed a very enjoyable story and so has Peter Lovesey. 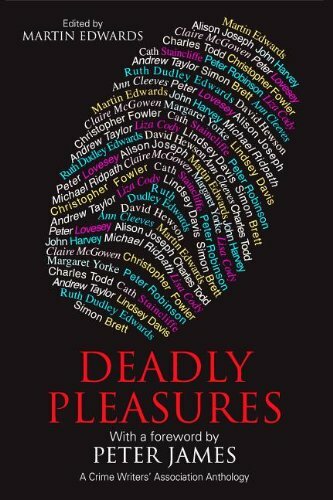 David Hewson, recent author of a novelisation of The Killing, has a story in the book, and so does Lindsey Davis, who offers a sort of companion piece to a story she wrote for Mysterious Pleasures, the Golden Jubilee volume I edited for the CWA a decade ago. The other contributors of brand new stories are: Ann Cleeves, Cath Staincliffe,Simon Brett, Claire McGowan, Alison Joseph, Ruth Dudley Edwards, Michael Ridpath, Charles Todd and Christopher Fowler. Oh, and me! I'm enormously grateful to the contributors, and also to Peter James, who wrote the intro. Let me assure you they didn't write these stories for the money, they just wanted to support the CWA, which is marvellous. There's one story that has been published before. Margaret Yorke, a former CWA chair who contributed to Mysterious Pleasures and other CWA anthologies I've edited, died while the book was in preparation. I wanted to include something by her as a tribute to her, and her family kindly agreed. All in all, it's a book I'm proud to be associated with, and I'm confident crime fans everywhere will love the stories written by some of the best writers around. The problem with acquiring books as enthusiastically as I do is that sometimes it takes far too long to get round to reading them. A case in point is my Forgotten Book for today, The Mummy Case Mystery by Dermot Morrah. I bought it years ago, and kept meaning to get round to reading it. But for reasons I simply can't explain, I've only just tackled it. And as so often, now I can't understand why it took me so long. It's a really good book. 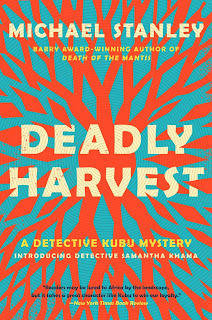 What prompted me to promote it ahead of dozens of other worthy books in the tottering piles in my cellar was the fact that the story is set in Oxford, and I thought it would help my research into locations for a literary walk of that city which I'll be conducting with foreign crime writers next month. But what really pleased me was how lively and enjoyable the story was. The book, first published in 1933, is set mainly in the fictitious Beaufort College, and features a dispute between two academics, one British and one Russian, who are fervent Egyptologists. When a fire in the college seems to result in the death of Professor Benchley, two of his colleagues decide to find out exactly what has happened, and the significance of an ancient mummy which Benchley paid a vast sum for but the fate of which is now unclear. I guessed the main twist, but that didn't spoil my enjoyment of this very smoothly written book one bit. It's a shame that Morrah, an Irishman who was a fellow of All Souls (where he shared rooms with Lawrence of Arabia) never wrote another detective novel. He was a gifted man who went on to write leaders for The Times and books about royalty - and industrial life insurance. He also wrote speeches for members of the Royal Family, including the Queen, and was a member of the College of Arms. All very worthy, but this novel shows that he also had a real talent for light and amusing dialogue and characterisation. "Although we were both born in and grew up in, South Africa we got to know one another in Minneapolis in the USA. Stanley was a professor of education technology at the University of Minnesota; Michael gave up South African summers to work with mathematicians there in the mid-west winter (which both of us pretended to enjoy). We soon found out that we shared a love of the African bush, wine, good food, music, and that we were happiest on a project if we were working with other people. Stan co-authored several text books with different partners; Michael wrote mathematics with a circle of collaborators. 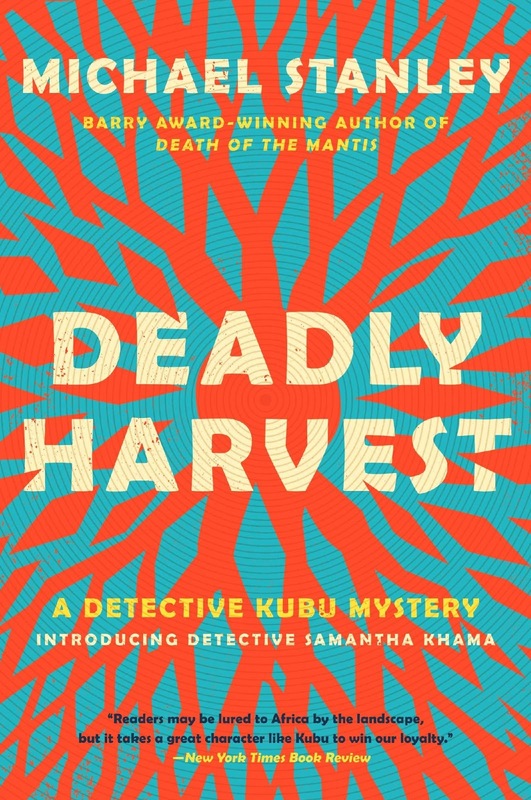 Even though neither of us had written any serious fiction, we had an idea for writing a crime-fiction novel while we were on one of our trips into the southern African bush. Stan is a pilot, and we’d fill a small plane with friends, food and wine – not necessarily in that order of importance – and head off to the wilderness areas of Botswana, Zimbabwe and Zambia. On one trip to the Chobe game reserve in Botswana, we saw a pack of hyenas pull down a fully grown wildebeest. Twenty hyenas reduced it to nothing but the hooves and horns in a matter of hours. 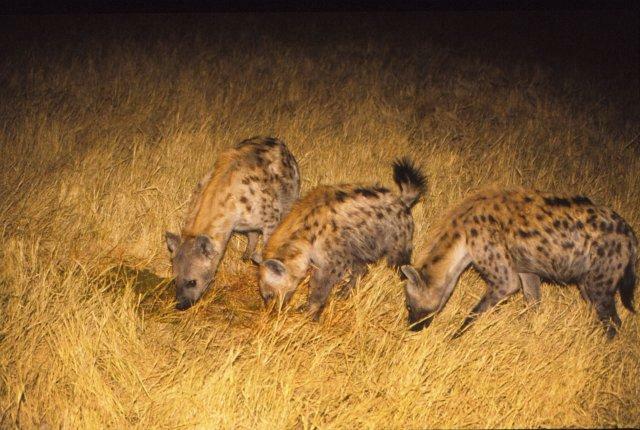 One hyena may be a scavenger, but a group of twenty forms a fearsome predator. No doubt after opening a few of the bottles referred to above, we started talking about the perfect murder. 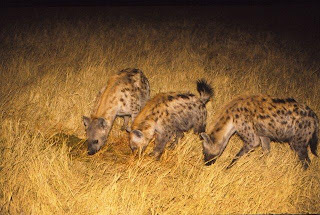 The victim’s body is thrown out in the bush for hyenas to consume. Nothing will be left. Nothing for the police. Nothing for forensics. The premise became more appealing as more bottles opened. Was there any doubt that we would use this idea to write a novel together? Well, because we so greatly enjoyed collaboration - the brainstorming, the feedback, the other interested participant – there was no doubt that if we did something, it would be together. More to the point was whether we would do anything at all! That took about twenty years to resolve. Five pages later he had the first draft of the first chapter. It was pretty bad, but he didn’t know enough to realise that at the time. He emailed it off to Stan who was intrigued and asked the magic question every crime fiction writer wants to hear: “So what happens next?” Michael had no idea. “This is a collaboration, right?” he responded. He waited with bated breath for chapter two. When we started writing fiction, we knew very little about it. We learnt a lot by writing that first book, and by reading, and from writing groups, and by brainstorming, and most of all by rewriting and rewriting. We even learnt that fiction is normally a one-person show. But then later, we learnt that there are some very good and successful crime writing partnerships. The most important thing we learnt was that we have an enormous amount of fun writing together. Writing together was never the issue. Writing fiction at all was another matter!" How many characters in a novel? When starting a new book, a vital question is: how many main characters will take part in the story? This is closely linked with the question of how many murder suspects to include, although the two issues are not quite identical. I often give this a lot of thought, because it is vital that readers care about the characters, even if they don't like some of them. My latest reflections on this topic have coincided with reading a book by Ruth Rendell which highlights the dilemmas that an author can face. In The Frozen Shroud, I tried to address this by reducing the number of potential suspects. This made me worry that the solution to the mystery might be too obvious, but I'm reassured by the reviews that are in to date. With my new book, though, I'm going to tackle the issue in a different way. Ruth Rendell's The Saint Zita Society boasts an unusual way of helping the reader disentangle what was going on. Rather than have a 'cast of characters' in the manner familiar from some trarditional mysteries (those fine writers Ngaio Marsh and Christianna Brand were keen on this device), the publisher included a diagram of Hexam Place on the endpapers of the book. This showed the houses and listed their occupants. A neat concept though I have to say that, even so, I found myself overwhelmed with the number of people who cropped up in the first fifty pages, not something I've ever experienced when reading with this gifted writer. Clearly, she too is continuing to experiment with her approach, and that is what keeps authors fresh.. Murder in the Basement, my Forgotten Book for today, is an Anthony Berkeley novel that I first read more than twenty years ago. Back then, to be honest, I was rather disappointed by it. There was less humour than I expected and the whodunit aspect was not as strong or as clever as in some of Berkeley's other books. But I've re-read it and revised my opinion dramatically. It's a much better book than I appreciated the first time around. The structure is unorthodox. A newly married couple arrive at their new suburban house, only to discover that a body has been buried in the cellar. The corpse belongs to a woman, who has been shot, but Chief Inspector Moresby and his team struggle to identify her. Then they get a lucky break and work out that she formerly worked at a prep school. Enter Roger Sheringham, Berkeley's usual amateur sleuth. He has had a spell teaching at the school (talk about the long arm of coincidence!) and he's actually started writing a novel featuring his former colleagues. But which of the women was the victim? I'd completely forgotten that this is a book with a "whowasdunin" element as well as a whodunit plot. The "whowasdunin" was most famously associated with Patricia McGerr, author of Pick Your Victim, but Berkeley beat her to it by nearly a decade and a half. It's a device that works well, and more than compensates for the subdued nature of the book that troubled me originally. As usual, Roger Sheringham delights here in helping to thwart justice (or, perhaps, to do justice in a very unconventional way.) Berkeley was in some ways, it might be said, an amoral writer. But there's a cleverness about this unusual story that I didn't recognise as I should have done when I first read it, probably because I was expecting something different. I'm glad I took the time to give it another try. And it provides a reminder that it may be a mistake to write off a book, or even a writer, too readily. Something I'll bear in mind in relation to a new book I've just read, a rather overblown example of Eurocrime, that didn't live up to my expectations. Maybe I just wasn't in the right frame of mind for it. Ah, those two little words that mean so much. Two words that are so exciting for any novelist, yet also often rather daunting. Chapter One. The start of a new book. A fresh beginning. A chance for a breakthrough, possibly. Or heartache and frustration, perhaps. Yep, I'm in philosophical mood this evening. For, having returned from work and had something to eat, I'm going to sit right down and write...well, a few paragraphs at least. This new book is going to be another Lake District Mystery, and I've mapped out in my mind key elements of the main plot, which has its roots in the past, and also a couple of sub-plots.I've thought about the main characters, and have a good idea of their main personality traits. But there's still quite a lot I'm unsure about, especially about how the detective work will be carried out, that I hope and expect will be filled in during the months ahead. As usual, I don't know how long exactly this book will take to write, though I'm hoping it won't be more than twelve months. We'll see. I am, though, excited by the main ideas behind the story, and that's mportant, because a writer needs to be excited by the basic concept of the book in order to keep going when morale starts to suffer - as it usually does at some point. I'm rather tempted to write a number of blog posts about aspects of writing generally, and about the writing of the book specifically, as I proceed. How this will work out in practice is hard to foresee. I'll stop if I think it's getting tedious for my loyal readers, or if it gets in the way of the actual writing. But I hope it will be interesting for you, and for me. Over the past few weeks, I've been averaging a blog post a day, as well as venturing a few steps into the mysterious world of Twitter (a world I'm still rather unsure about, to be honest.) Now I'm planning to revert to three or four blog posts a week to give me a bit more space for writing the novel. As always, I'll very much welcome your comments, whether posted on the blog or sent by email. One final word about Blogger. I hope I'm not speaking too soon, but it seems as though the wretched problem of spam comments has been resolved, at least for the present. I've not had any spam comments for a while now, whereas sometimes I was getting up to twenty a day - very tedious. I assume this also means that the Blogger stats are becoming more reliable. I'd welcome any feedback from fellow Blogger bloggers on their own experience.. I'm just about ready - at last! - to get going with Lake District Mystery number seven. And as part of my planning process, I've been weighing up what I can learn from past reviews, and especially reviews of The Frozen Shroud. One of the great merits of well thought-out reviews from an author's perspective is that they help to highlight what works and what does not. A single review in isolation may not make much difference, but I've now looked at about twenty reviews and I think I've picked up some helpful messages. First, and I suppose most important in terms of morale and motivation, there's no sign that reviewers who have followed the series for several books are becoming weary of it. (A big relief, to be honest.) Some people have said that The Frozen Shroud is the strongest book in the series, and although that's a matter of subjective judgment, I'm pleased that there's enough freshness about the series after six books to keep most readers happy. Plot, setting and characterisation are the key elements, so I was very happy with this review from Steve Steinbock in the Jury Box of Ellery Queen's Mystery Magazine, one of the most important publications in the genre. Was the whodunit plot strong enough? I did wonder about this, and one or two reviewers indicated that they were able to figure out what was going on sooner than usual. On the whole, however, the reaction expressed in Long and Short Reviews was more typical, and I found this encouraging, as the cast of suspects in this book was slightly smaller than in some of the others. This was a deliberate decision, but it did pose a challenge in terms of keeping the reader guessing. I went about it in a very specific way, though I can't say more than that here, for fear of spoilers! One of the most satisfying reviews of all appeared in a blog I've never encountered before, Thiking About Books. It's not so much that this very detailed review heaps more praise on the story than various others. What really struck me was that the reviewer "got" very clearly what I was trying to do with this book. Of course, I'm glad the book found favour, but I'm even more gratified that some of the things going on below the surface of the story were identified. This is truly rewarding for any novelist, especially in a genre that tends to be assessed in a rather superficial way.. So much for the nice things, what about the criticisms? A couple of reviewers didn't love the characters, but they were very much in a minority. More significant is that the gradual way the suspense builds up appealed to some more than to others. Inevitably it's a question of personal taste. Some want instant gratification, some like the pleasure of suspense and uncertainty. But I am conscious that my Lakes books tend to build slowly, as do the books of a number of the authors whom I most admire. All this is, however, prompting me to contemplate a variation of approach in the new book. Not a crash-bang-wallop opening, so much as a different way of starting the story. How will that work? Well, that's the big question for the coming weeks! Styal is a village in Cheshire where you can find one of the National Trust's great gems, Quarry Bank Mill, a wonderfully preserved and historically very important slice of Britain's industrial heritage in truly beautiful surroundings. Quarry Bank has been developed steadily in recent years,and not so long ago the garden of the old house was opened to the public. And on Saturday night, for the first time, I saw a play staged in those gardens in the open air - Agatha Christie's The Hollow. It's a very long time since I watched a play in the open. The last one, a Noel Coward play, was well over twenty years ago. Of course, the weather is always a bit of a worry. But the weather on Saturday evening was superb, a real stroke of luck. And this, coupled with a pre-play picnic, made for a lovely way to end a great day that had begun with a trip around Blackpool's Stanley Park. Strangely, this was the third Agatha Christie play I've seen in about three months, after not having seen one for many years. They have all been fun, even though I'm the first to admit that she was not as gifted at writing for the stage as she was at writing novels. But a large audience had a great time, not just because of the sunshine, but because Christie knew how to keep people engaged. The performances by members of the Wilmslow Green Room were very good, and I was pleased to recognise at least one of the actors who recently appeared in my own Victorian murder mystery. The Hollow has never been one of my favourite Christie novels, I must confess. The plot, and the final twist, have never struck me as matching her best. But some of the characters are quite interesting, as is her decision to dispense with Poirot in the stage version of the story. I think that was a shrewd move, and the result was a piece of light entertainment that made for an idyllic midsummer's evening. Yesterday saw me in conversation with Kate Ellis at Blackpool Central Library for a lunch event that formed part of Blackpool's Wordpool Festival. It was a bit different from previous gigs Kate and I have done together, and the freshness of the format appealed to me. I was pleased by the turn-out - forty-odd people on a very sunny day - and this and the diversity of the audience, who were very responsive and engaging, showed how well Lynne Pattinson and her colleagues in the Wordpool team have done in developing this festival over the past few years. It's the second time I've been part of Wordpool, and I sense that the festival is going from strength to strength. Such events need a number of years to establish themselves in the public consciousness, and I can only hope that, (even though the writers who take part aren't paid fees, so I'm not arguing for more money for me!) funding continues to make sure that Wordpool continues to flourish and grow. It was nice that the council's chief executive took the trouble to come along to the event, and I like to think he will have gone away happy with what his people in the libraries and culture part of the authority are doing to promote literature, and a good deal else besides, for the benefit of the local community.. This sort of thing matters everywhere, and arguably it's of especial value in a large town like Blackpool, which is embarking on a process of recovery and regeneration after years in the doldrums. It's a town which scores quite poorly on some indicators; for instance, I was told that there are many people with mental health and other problems, and even in an age of austerity, it's important for the country as a whole that these communities are given every chance and encouragement to thrive. I've always had a soft spot for Blackpool, and as I said during the event, I'd rather like to write a short story set there. I went to the famous Illuminations as a child, and have taken my own children back there from time to time. We even once had a week-end break there in January, and while this may seem odd,i it was really enjoyable. It's a place that caters for families better than most, and you don't have to spend a fortune, either. Yes, it's a town with its tawdry aspects, but it also has a lot of vitality and some great traditions. Relying on past glories isn't enough, but I seized the chance to stay around for a day and a half and enjoy the sunshine. Not just visiting the piers and the sea front, but also Stanley Park, which is one of the largest and (in my opinion) most appealing of municipal parks in Britain, with a lovely heronry and much else besides. There's no denying that Blackpool still suffers from its reputation as a haven for rowdy stag and hen parties and it's not a must-see destination for enough people outside the north west of England, let alone overseas. But perhaps it should be. It's a resort full of character, and I'm really pleased to see it's heading in the right direction. My Forgotten Book for today is another from the very reliable Golden Age writer Henry Wade. The Hanging Captain is a good story, although by no means his best, and it reintroduces Inspector Lott, who featured in The Dying Alderman, rather than Lott's Scotland Yard rival, Inspector John Poole, who was Wade's best known detective. There are two fascinating aspects to the book. First, Wade's take on the decline of the ruling classes in Britain. This comes over very clearly and quite evocatively. Wade was an aristocrat himself, but although his writing often had a touch of nostalgia, plus a strong respect for tradition, he had no time for people who squandered the advantages life gave them, at a time when things wee tough for millions. Ferris Court, the home of Sir Herbert Sterron, is a fading country house with an overgrown garden. Sterron is short of money and is starting to resort to selling (metaphorically) the family silver. He is impotent (this information is conveyed to us delicately but unmistakably) and his much younger wife is attracting other men. So when he is found hanging from a curtain cord it comes as no great surprise. Needless to say, though, before long murder is suspected. The other striking element of the book is the friendly but competitive relationship between Lott and the local police. Lott has been called in because the locals fear embarrassment, since the High Sheriff of the county is a suspect. Wade knew what he was talking about, as he was once High Sheriff of Buckinghamshire. His account of police work and the humanity of police officers is a recurrent strength of his books. This one focuses on a time of death mystery, and the puzzle element is competent but no more than that. Overall, though, this is a novel with qualities which make it still worth reading today. My Forgotten Book for today, Death at Broadcasting House (known as London Calling in the US) was a joint effort. The authors were two men who worked for the BBC, Val Gielgud, brother of John, and Eric Maschwitz, who used the pen-name Holt Marvell. Of the two, Gielgud was the great enthusiast for the genre. He was a good friend of Dorothy L. Sayers and John Dickson Carr, and ultimately earned election to the Detection Club. This early effort, however, is perhaps his most famous. And that is because of the use of Broadcasting House as a backdrop for a pretty ingenious murder, when an actor is killed in front of an open microphone when . The setting is described in great detail, making the novel a wonderful period piece as far as a modern reader is concerned. No fewer than three floor plans are provided, and they are quite useful for anyone who wants to take a practical approach to sleuthing, and beat the likeable Inspector Spears to the solution. I didn't find the murder mystery deeply engrossing, but the portrayal of life in and around the BBC at that time was absolutely fascinating. The plot, with all its contrivances, I'd rate as functional, but there is a great appeal in getting the "feel" of somewhere interesting, and the BBC under the legendary Lord Reith was certainly that. Gielgud in particular was a capable writer, and it's a shame that his crime novels are now overlooked. He wrote five with Marvell/Maschwitz, concluding in 1940 with The First Television Murder, which I haven't read, but where presumably the clue is in the title. Later, he wrote solo, and his career lasted until the mid 70s. In addition to his long and successful career at the BBC, he also found time to get married five times. A busy man. Brake is an unusual film from last year, directed by Gabe Torres and starring Stephen Dorff, neither of whom I'm familiar with. It's a modern film, in style and plot-line, but it raises a question about writing that is familiar whether we consider prose, television or film. In fact, a question that lingered in my mind in relation to a recent episode of Agatha Christie's Marple, Greenshaw's Folly. The issue is this. When an idea for a story occurs to a writer, an early question is whether it will make a full-length novel or a short story, a short television programme or something longer, a series perhaps. Or a short movie as opposed to a full-length feature film. The dilemma for the writer is that one doesn't want to "waste" a great idea on a small scale form. But on the other hand, stretching out an idea beyond its natural limits can ruin everything. Greenshaw's Folly was a two-hour show based on a short story. The screenplay writer added in elements from a second Agatha Christie story to make the episode work, and (just about) got away with it. Brake involves an American secret service agent called Jeremy (Dorff), who wakes up to find himself encased in a transparent box. It turns out that he is locked in the boot of a car, although conveniently his captors have provided him with a telephone. Their plan is to torture him to make him reveal the whereabouts of the President's secret bunker.Almost all the movie takes place in this confined setting, quite a test of acting skill as well of the writer's imagination. Then we are supplied with a double twist ending. I enjoyed the film, but felt that it was a good example of an idea stretched beyond its natural length. I suppose a movie of sixty minutes wouldn't have been commercial enough, but I'm afraid the limited nature of the scenario became a bit wearing, even though Dorff did a good job with his role. And as a result,there was too much time for the audience to feel as trapped as poor old Jeremy. And too much time to ponder the gaps in the plot as well. A pity. I've never had any urge to write a memoir or autobiography, but I've read a good many. Most of them leave something to be desired, often because the author succumbs to the temptation to write in a self-serving way. But there are some good ones around, including Time to be in Earnest, by P.D. James, which is (of course) very readable indeed. And I quite liked Agatha Christie's autobiography. Even there, though, one wonders about what has been left out, for instance because the author found it too difficult to write about. Memoirs of showbiz stars and politicians are especially dodgy. I am a huge fan of Dionne Warwick, whose voice at its best was almost unequalled in its power, range and sensitivity. Yet her memoirs were very disappointing as far as I was concerned. I learned little of interest and felt that she was too anxious to present herself positively. Accordingly, I approached the brand new autobiography of Burt Bacharach, Anyone Who Had a Heart: my life and music (published by Atlantic Books in the UK) with trepidation. I admire the composer enormously, but I've heard all his anecdotes before. Or so I thought. I wasn't prepared for a book that was far from an exercise in self-justification. Bizarrely, it's more like an exercise in self-flagellation. There's a great deal about his failed marriages and other relationships (he was the perfect choice to write a movie song called Wives and Lovers, that's for sure) and a huge amount about the tragic life and eventual suicide of his daughter Nikki, If I had three ex-wives, I am fairly sure I wouldn't have the courage to invite them to express their views about me in my autobiography, but that's what we have in this book, and it sometimes makes for very bleak reading. The ghost writer is Robert Greenfield, a long-time journalist for Rolling Stone, and in many ways he has done a very good job. It's an extremely readable book, with many witty and unexpected stories (I specially liked the one about Elizabeth Taylor's dining habits). More importantly, it casts light on what it is like to be an obsessive, someone so ferociously devoted to perfectionism in his craft that he allows other things to happen in his life that are a long way short of perfect. It's an extraordinarily human, warts and all portrait. For a novelist like me, this makes riveting reading, and it would do even if I had not loved the man's music for as long as I can remember. I do, however, think that Greenfield could have produced an even better book with a bit more work. There's not enough analysis of the people, the fascinating world that Bacharach has moved in, or of the music. It's very interesting and entertaining, there's plenty of scope to read between the lines, and it must be one of the best showbiz memoirs for many a long year. But I still wish Greenfield had shown some of the perfectionsm of his subject. Had he done so, he'd have contributed to an even better book. Every now and then, a publisher brings out a series of classic crime novels of the past. I can think of a few series of this kind that, much to my regret, did not last very long. But one of the longest and best series was the "Fifty Classics of Crime Fiction 1900-1950", edited by two Americans with a great knowledge of and love for the genre, Jacques Barzun and Wendell Hertig Taylor. I have read only about twenty of the fifty books they chose. Naturally, I've loved some of the books, and wondered about one or two why Barzun and Taylor rated them so highly. These things are to some extent a matter of personal taste. But their choices, if sometimes idiosyncratic, were always interesting. An example is Alarum and Excursion, by Virginia Perdue, her last book, first published in 1944. I was prompted to read this one by an enthusiastic review by John Norris of Pretty Sinister Books. John, like Puzzle Doctor and Curt Evans among other enthusiasts for the classic mystery, is a blogger whose judgments about a book always command respect. This is a case of a book which I didn't love as much as John did, but I can see why he, along with Barzun and Taylor, admired it. It's an amnesia story. The hero is a wealthy businessman in his sixties who has come across a formula for a fuel that could affect the course of the war, and much else besides. When he comes round, he slowly pieces together what has been going on in his life. As ever, the question is: who can he trust? Now, I am not a great fan of stories about secret formulae, and amnesia cases are also a bit of a cliche of the genre. But Perdue does a good job of creating an unusual story-line and I agree with John and others that the finale is excellent. This book is good but not, in my view, an absolute classic - it reads a bit like a novel by Helen McCloy, but does not have quite the same power. All the same, it's an entertaining read, and I'm glad I gave it a go. As for Perdue herself, I know little. Even Barzun and Taylor don't rate her other books. Perhaps she died just as she was getting into her stride as a novelist, which is a sad thought. In a short space of time, Belinda Bauer has established herself as one of my favourite contemporary authors. Her latest book, Rubbernecker, is a memorable piece of work. I'm tempted to say that it's not for the squeamish, but then, I'm rather squeamish, and I really liked it. There are lots of descriptions of what it is like to be in a coma, and to dissect bodies in an anatomy class, and I must admit that I didn't linger too long over some of this material. But what makes this a fine novel is the combination of superb characterisaton and a very clever plot. These are the ingredients that made Minette Walters' early books hugely successful, and I think Bauer is definitely in the same league. The main protagonist is young Patrick Fort. Bauer specialises in telling stories from the point of view of boys or young men, and she captures Patrick very well. Thsi is quite an achievement, since he has Asperger's Syndrome. I am no expert, but I do know a small amount about the challenges of living with this condition, and it seems to me that Bauer's empathetic portrayal is as effective as Mark Haddon's in The Curious Incident of the Dog in the Night-Time. At first, I wasn't sure how Rubbenecker was going to fare in any comparison with Haddon's book. Bauer took a risk, I think, when she opted to venture into similar territory. But it paid off. Her book is quite distinctive. The build-up is relatively steady rather than providing instant reader gratification, but as I've mentioned before in this blog, that's a technique that plenty of writers (including me) use, and Bauer never lost my attention. I took an instant dislike to one character who made it clear at the outset that he didn't like a very good song by Rupert Holmes, and Bauer probably intended this. But I felt very sorry for him when eventually I learned of his fate, and this is part of her skill.. There's some wonderful black comedy as Patrick decides to investigate the apparent murder of a corpse he and his classmates have been dissecting. A police officer called Williams who is introduced late on in the story is given some marvellous lines, though I was a little surprised by the DCI who had never heard of vagal inhibition, when a retired cop was telling me about it only a couple of weeks ago. Equally good is an awful nurse who is out to ensnare a rich husband in an entertaining sub-plot. The attention Bauer pays to her minor characters is the mark of a gifted writer. I read one national newspaper review that carped about some aspects of the book, but although there was quite a bit of coincidence in the story, where would crime writers be without the occasional coincidence? The last part of the book is especially strong, and I eagerly look forward to what Belinda Bauer will do next.. Yep, I'm a fan.